When we really stop and think about it parenting is really all about conversations. This is how we communicate with our children. We have conversations which allow us to teach our children about everything. It is our gentle coaxing that prompts our baby to take his or her first step. Parents encourage their children to try new types of food from the first taste of cereal to eating peas. Parents caution their children to avoid dangerous items in a home, like electrical plugs or a hot stove. All of these learning experiences involve conversations, two-way conversations, questions and answers. As parents we move through monologues to dialogues with our children. Sometimes conversations with our children about alcohol and drugs come very early in life. This may happen because one parent suffers from the disease of addiction or maybe some other loved one's life has been impacted by the disease. Circumstances like this may prompt a parent to start the conversation. Many United States school districts offer a Drug Abuse Resistance Education (D.A.R.E.) program to their sixth graders. So if a parent has not started the conversations about alcohol and drugs by the time their child reaches sixth grade, there is a pretty good chance that their child's participation in D.A.R.E. will trigger this conversation. These conversations may vary. They may start out as informative and then proceed to more engaging talk about the parent's own experimentation with drinking alcohol and using illicit drugs. Many parents weigh the efficacy of whether they should admit to having smoked pot when they were in high school, college, or even later in life. Do you admit to your child that you drank alcohol in high school? Do you tell your child that you smoked cigarettes? Or do you attempt to keep the conversation on a much higher level, so as not to encourage your child to conclude "well, Mom and Dad drank alcohol before they turned 21 and even tried pot...and they turned out okay...so what's the harm?" This week The Partnership at Drugfree.org released a report of a study their organization completed with a sponsorship from MetLife Foundation. This study involved surveying 3,884 teenagers in ninth through 12th grade. The surveys were anonymous questionnaires completed between February and June 2012. 817 adults were surveyed from August 2012 through October 2012. The margin of error for the teenagers surveyed was +/- 2.1 percentage points, while the margin of error for surveyed adults was +/- 3.4 percentage points. When teens were asked about the last substance abuse conversation they had with their parents, just 14 percent said they talked about abusing a prescription drug. By comparison, most teens - 81 percent - said they have talked about the risks of marijuana use with their parents. Almost the same number said they have discussed alcohol with their parents. Almost one-third said they have talked about crack and cocaine. One in six parents said using prescription drugs to get high is safer than using street drugs, according to the survey. 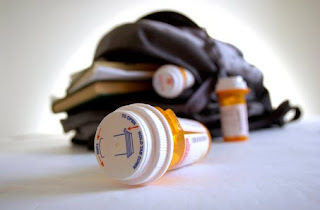 Almost one-third of the parents said attention deficit hyperactivity disorder (ADHD) medications such as Ritalin or Adderall can improve a child's academic or testing performance even if the teen does not have ADHD. One in four teens in the study said they had misused or abused a prescription drug at least once. That's up sharply, a 33 percent increase, in the last five years. One in eight teens report misusing or abusing the drugs Ritalin or Adderall - stimulants prescribed to treat ADHD. Take the time to have the 'life-changing' conversation with your children. It is the best gift you can give your children.